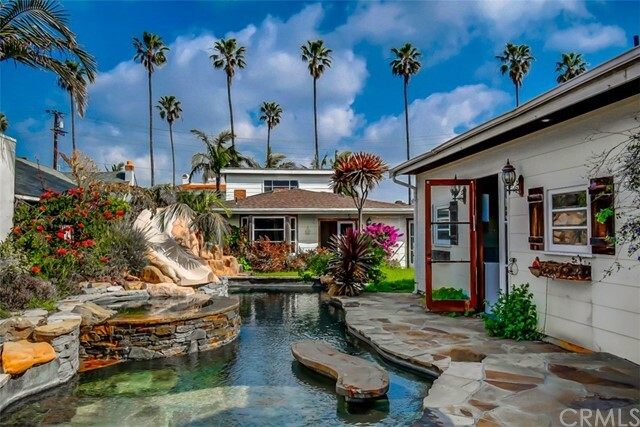 Quintessential beach home...amazing location with ocean views! This home features 3 bedrooms PLUS a loft upstairs, 2.5 bathrooms, cozy kitchen, dining room and living room with fireplace. Majority of the interior has the original red wood paneling and wood beamed ceilings creating a cozy atmosphere. In addition to the main house there is a separate detached pool/guest house built in 2007 approximately 600sqft in size with gourmet kitchen, full bath, walk-in closet, fireplace, vaulted ceilings and bi-folding sliding doors opening to the backyard. The large lot size is lush with beautiful greenery and a free form tropical style pool compete with slide, swim up bar, Baja shelf and spa...there is even an outdoor shower to rinse away the sand! Plenty of parking with a large 2 car garage and long driveway are the icing on the cake. The main home is in original condition and just waiting for you to make it your own! © 2019. The multiple listing data appearing on this website, or contained in reports produced therefrom, is owned and copyrighted by Multi-Regional Multiple Listing Service, Inc. ("MRMLS") and is protected by all applicable copyright laws. Information provided is for viewer's personal, non-commercial use and may not be used for any purpose other than to identify prospective properties the viewer may be interested in purchasing. All listing data, including but not limited to square footage and lot size is believed to be accurate, but the listing Agent, listing Broker and MRMLS and its affiliates do not warrant or guarantee such accuracy. The viewer should independently verify the listed data prior to making any decisions based on such information by personal inspection and/or contacting a real estate professional. Listing courtesy of Laurie Cappadocia from HomeSmart, Evergreen Realty . Last updated Thursday, April 18th, 2019.